Special teams are an important, but often-overlooked aspect of football. At PFF, we’re uniquely positioned to study this aspect of the game, grading every player at each facet of every game. In 2016, we developed an algorithm to rate special teams, taking into account how grades in each facet contribute to winning. Below are these ratings at the quarter point of the 2018 season. 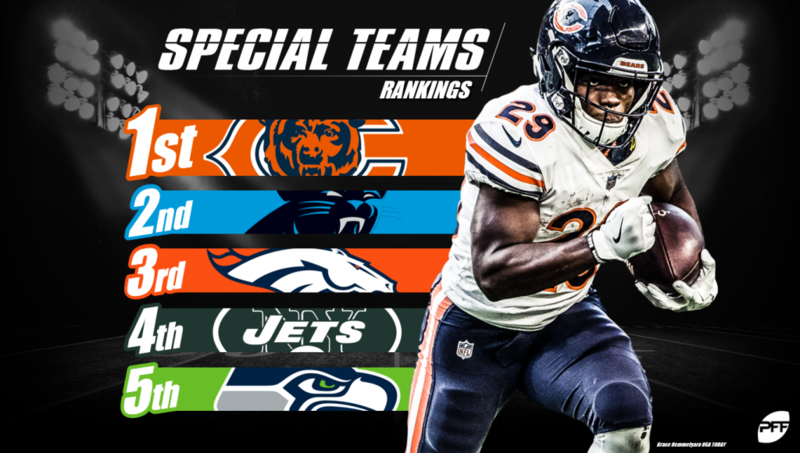 Tarik Cohen has been brilliant so far for the 3-1 Bears, taking 11 punt returns and turning them into 141 yards through four weeks. Michael Palardy is the league’s highest-graded punter so far, putting eight of his 14 punts inside the 20 and generating over 42 net yards per punt. Brandon McManus has been the highest-graded placekicker this season, connecting on all 16 of his kicks so far. Newcomer Andre Roberts has already generated 267 total yards on returns, including a touchdown against the Lions on the opening Monday night. It’s Michael Dickson’s world, and we’re all just living in it. The rookie has dropped 11 kicks inside the 20 and averaged over 44 net yards per punt so far. Punter Trevor Daniel has dropped 11 of his 18 punts inside of the 20-yard line so far this season. Return man Alex Erickson has averaged over 30 yards per kickoff return through four games, including a big return last week against the Falcons. They’ve rebounded nicely after a rough week 1. Nick Bellore and Teez Tabor both have multiple special teams stops so far this year. They won a game against Houston (with Blaine Gabbert at quarterback) in large part due to a passing touchdown by Kevin Byard on a fake punt. In addition to their blocked punt against the Falcons, Wil Lutz has been very good, converting 10 of 11 field goals through four weeks. This is higher than normal for the Chargers, and they have struggled at kicker with Caleb Sturgis. However, Drew Kaser has dropped eight of 13 punts inside the 20 so far, while Jatavis Brown, Adrian Phillips, and Uchenna Nwosu all have over three tackles without a missed tackle so far in coverage. Dwayne Harris earned AFC Special Teams Player of the Week honors against the Browns last week, on the back of a 49-yard punt return, 98 total punt-return yards and a special teams tackle. Record-breaking Adam Vinatieri has only missed one kick all year and is still yet to miss from inside 50 yards. Not as strong as most seasons under Dave Toub, they always have Tyreek Hill, who exploded for a punt return touchdown on his first touch of the season against the Chargers. The Rams have continued their strong play on special teams, including a blocked punt by special teams superstar Cory Littleton that was turned into a touchdown by Blake Countess. Jakeem Grant has continued to be an elite return man, with 289 yards and a touchdown return kickoffs. He might be an exception to the “don’t take it out of the end zone” rule. They could really only go up after last year, and their punter, J.K. Scott, being second overall in punting grades is a step in the right direction as they play field position with Aaron Rodgers returning to health. Special teams was a big reason they played above their metrics last year, and their regression there hasn’t helped much this season. New punter Corey Bojorquez has the lowest grade at his position group so far, accompanied by the lowest average hang time. The Falcons were snake-bitten by a blocked punt at home against the Saints in Week 3 but returned the favor against the Bengals in week 4. Brett Maher has been good since replacing veteran Dan Bailey, making all but one of his kicks so far and allowing opposing teams an average starting field position worse than the 25-yard line. Phil Dawson didn’t kick a field goal until last week and was only 1-3 doing so. However, Andy Lee has been the league fifth highest-graded punter through four weeks, and it’s likely they’ll need him and his 4.32 average hang time more than Dawson moving forward. Justin Tucker has continued his brilliant career this year, going 3-3 on field goals of over 50 yards so far. Ryan Allen has been the second-worst punter so far in terms of PFF grades, with an average hang time of just 4.19 seconds. Usually, the Eagles excel here, but their punt team, with new punter Cameron Johnston, has already allowed 114 return yards so far this season. A failed fake punt against Tennessee doesn’t help this rating, but that’s not the only thing contributing to this rating. New punter Logan Cooke has graded in the bottom five at his position through four weeks. Bryan Anger continues to remind us why he was drafted before Russell Wilson by averaging just 39.9 net yards per punt through four games. As much as the Browns kickers got the attention Week 1, the Steelers failed to win that game in large part due to Chris Boswell, who has continued to struggle since – making just three of six field goals and nine of 11 extra points. Both Kaelin Clay and Stacy Coley have mishandled returns in the first four weeks, which has suppressed the fact that Aldrick Rosas has yet to miss a kick so far. Tress Way’s 37.9 net average so far on punts is among the league’s worst, hampered by a punt team that has allowed 14.6 yards on five returns so far. A blocked punt for a touchdown, plus three missed field goals by fifth-round pick Daniel Carlson, basically cost them a win in Green Bay. A long way from where they ranked last year. Robbie Gould has been a bright spot, making all 10 field goals so far. However, they have already missed seven tackles in coverage through four weeks. They are 32 in this rating, and it’s not really close. It’s hard to pick out any one spot, but former draft pick Zane Gonzalez cost them a chance at 2-0 with misses against Pittsburgh and New Orleans to start the season.